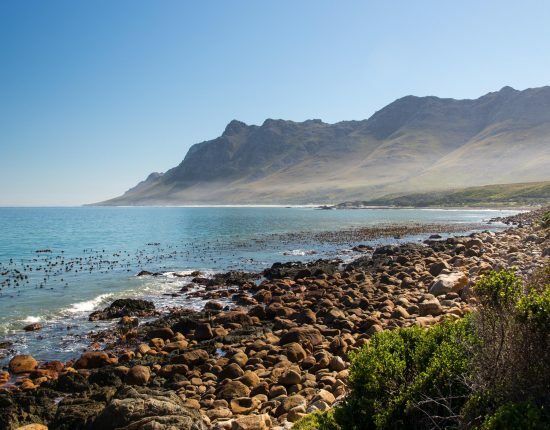 South Africa – Part 3: Cape Town and safaris! – Ouestef? 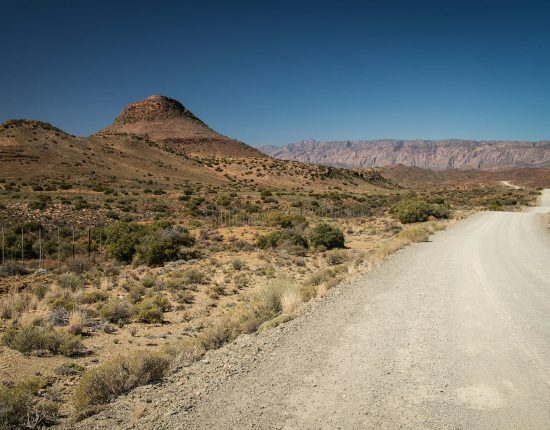 Having finished my two-week solo cycle tour around the Western Cape coast and the Klein Karoo, it was time for me to head back to Cape Town to join Angela. 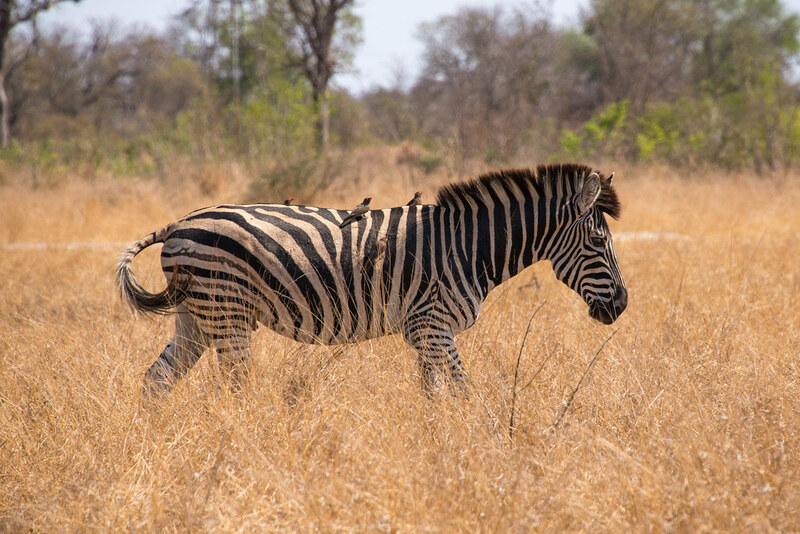 I still had two more weeks of holidays to look forward to, including the wedding of my friends Emma and Ben in Stellenboch and a trip to the north east of South Africa for some safari action in Kruger National Park and Nkomazi Game Reserve. I simply couldn’t wait to spend some relaxing time with my wife and friends! 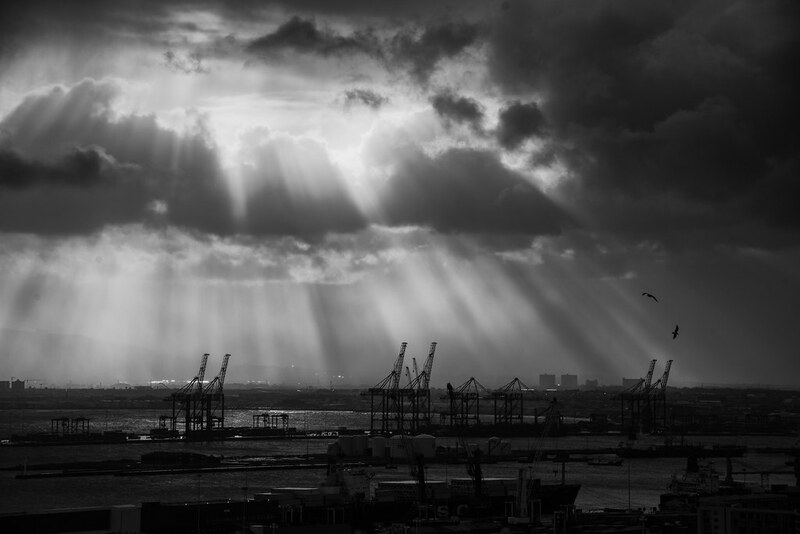 Enjoying the dramatic light over Cape Town’s harbour from the terrace of our Airbnb accommodation. After almost missing my bus in Swellendam (in my defense it had showed up 2 hours early!) I finally arrived back in Cape Town, 2 weeks exactly after heaving left it on my bicycle. Angela, who had arrived the day before, greeted me at the door of our Airbnb host with a big grin on her face. It felt great to see each other again! 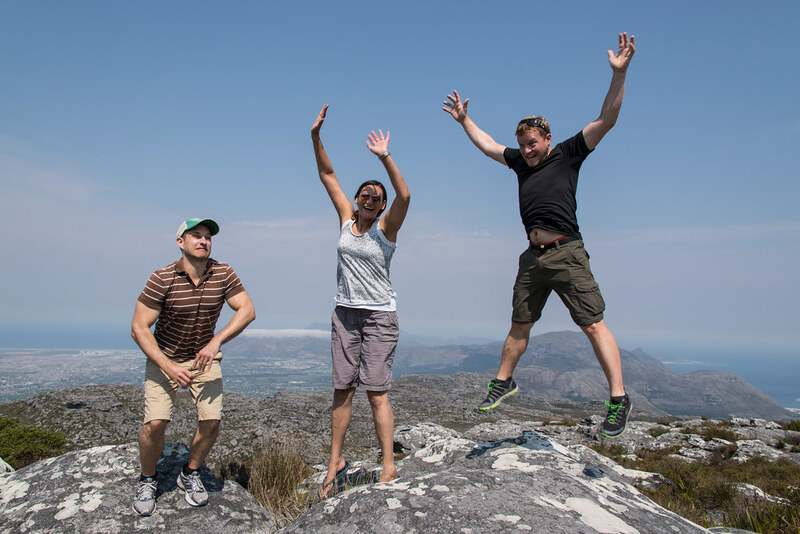 Different levels of success during a jumping photo attempt on top of Table Mountain. Terris, who’d also been invited to Emma and Ben’s wedding, joined us in Cape Town a day after my arrival. 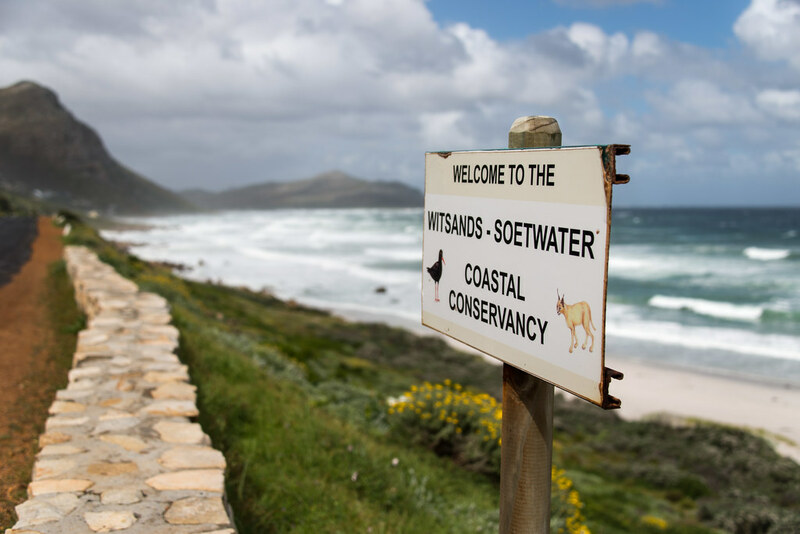 Together we rented a car and headed south along the east coast of the Cape Peninsula towards Cape Point. 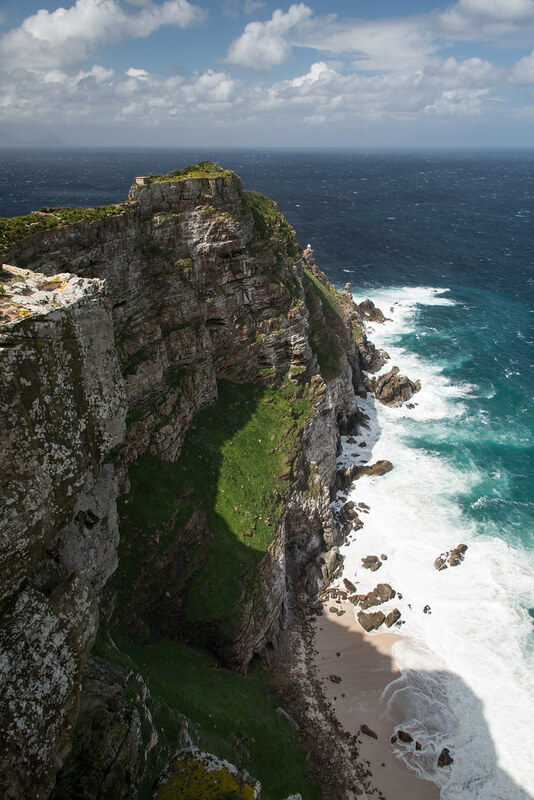 Windy and sea-battered Cape Point. 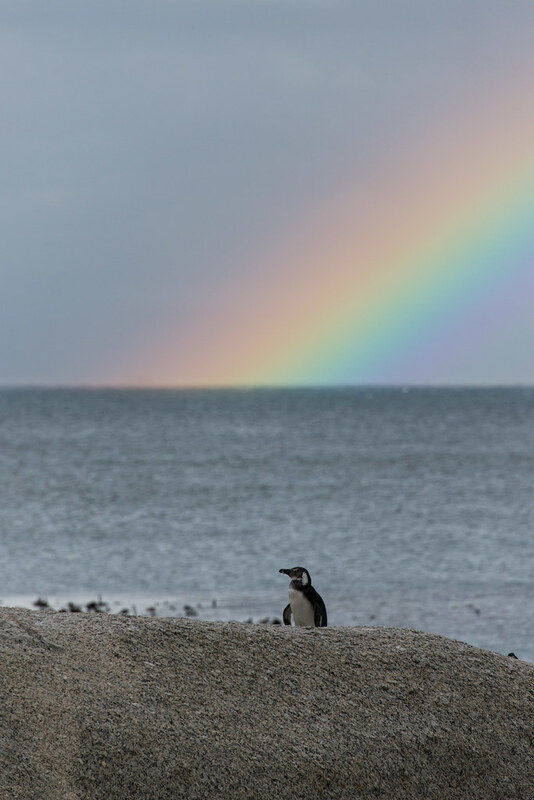 An African penguin on Boulders Beach in Simon’s Town. 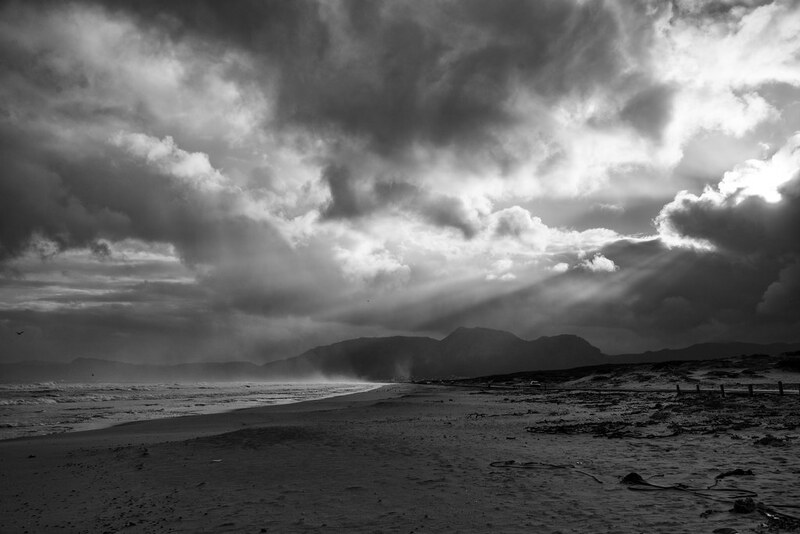 More dramatic light, this time as we take a short break on the beautiful wild beach east of Muizenberg on our way to Stellenbosch. 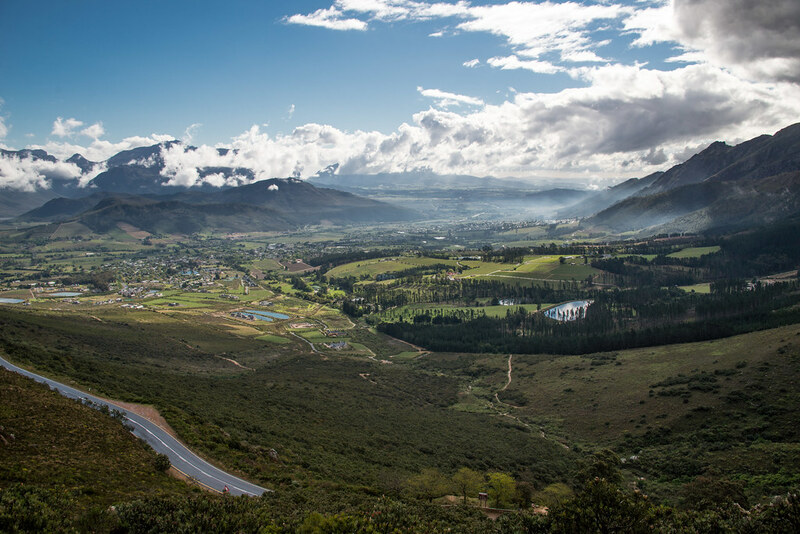 Enjoying the wonderful view towards Frankschhoek from the top of the pass on Road 45. After a couple of days in Cape Town, Terris, Angela and I drove to Stellenbosch to join Emma and Ben for their wedding. The day before the wedding, while the girls treated themselves to a day at the spa, the boys enjoyed a delicious meal at at a vineyard in Frankschhoek. As for the actual wedding the next day, well it was truly amazing: a beautiful venue on a vineyard with a backdrop of mountains, a warm and sunny day, delicious food, great company and most important of all fabulous dance moves throughout the night. What else could you ask for? 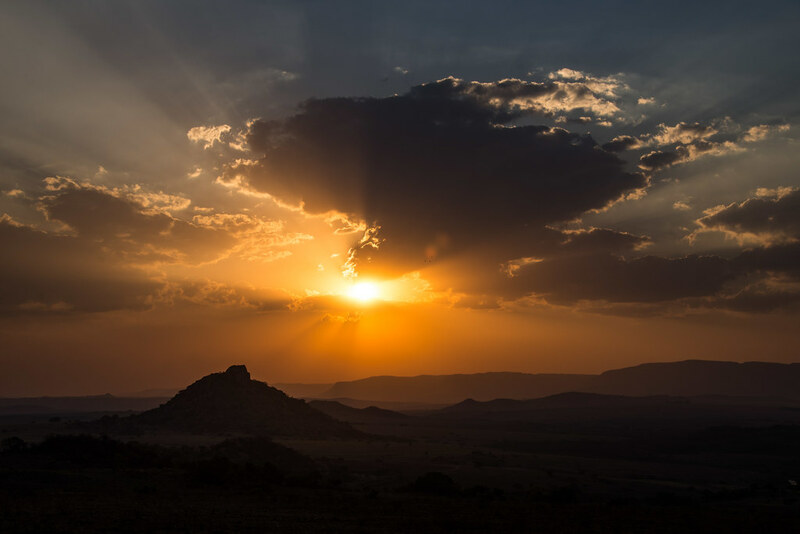 After 6 short days in the Cape Town area and that amazing wedding in the Stellenboch vineyards, Angela, Terris and I joined the newly weds and and some of their family and friends for a safari adventure in the north east of South Africa. 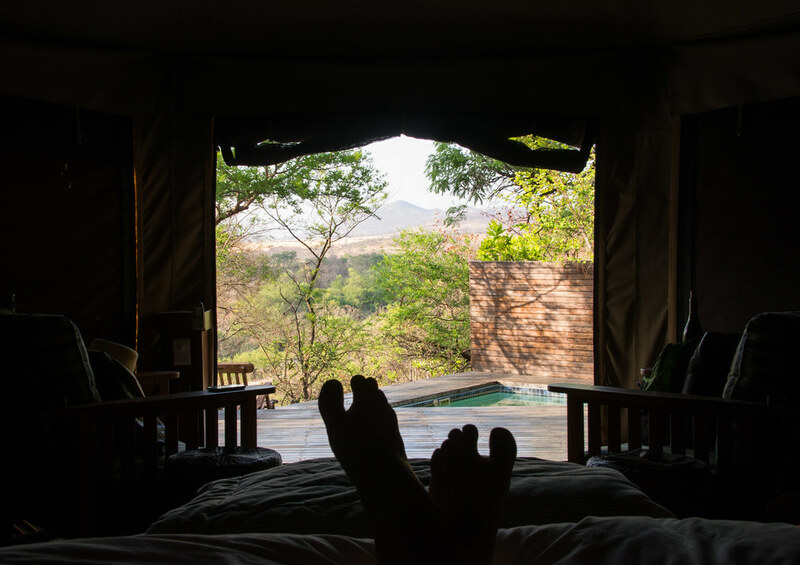 Our first stop was Kruger National Park: using Sabie River Bush Lodge on the edge of the park as our base camp, we drove around the reserve in a rental car for 2 days. 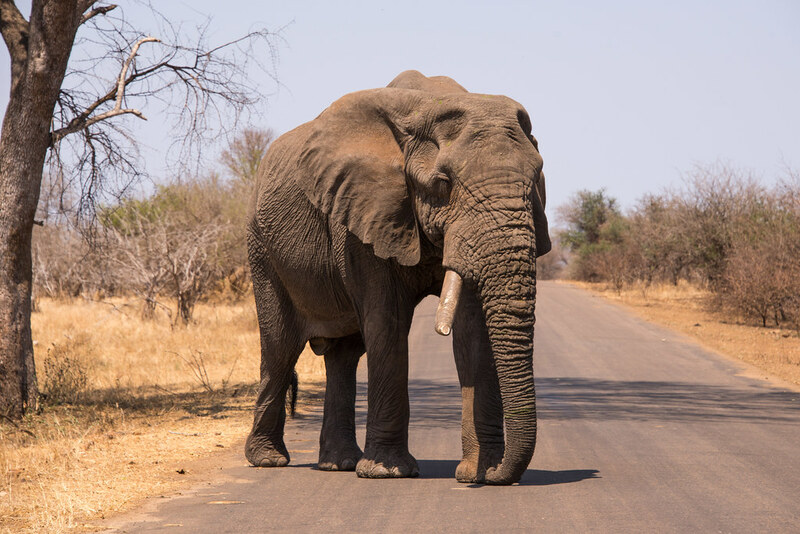 On the first morning, as we were about to enter the National Park, a horde of African elephants suddenly appeared out of the bushes behind us and attempted to cross the road. Everyone in our group got very excited and tried to get as close to the large mammals as they could in order to get a good picture. 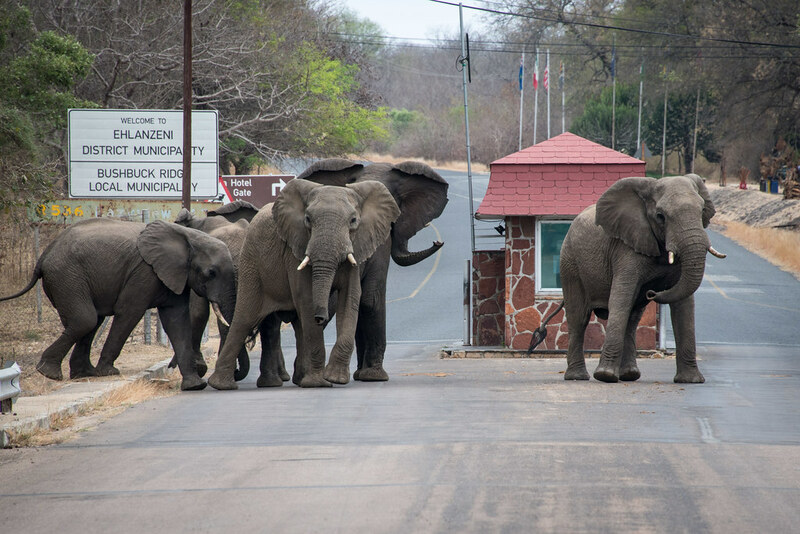 Unfortunately that scared the elephants off and sent them running back the way they came. 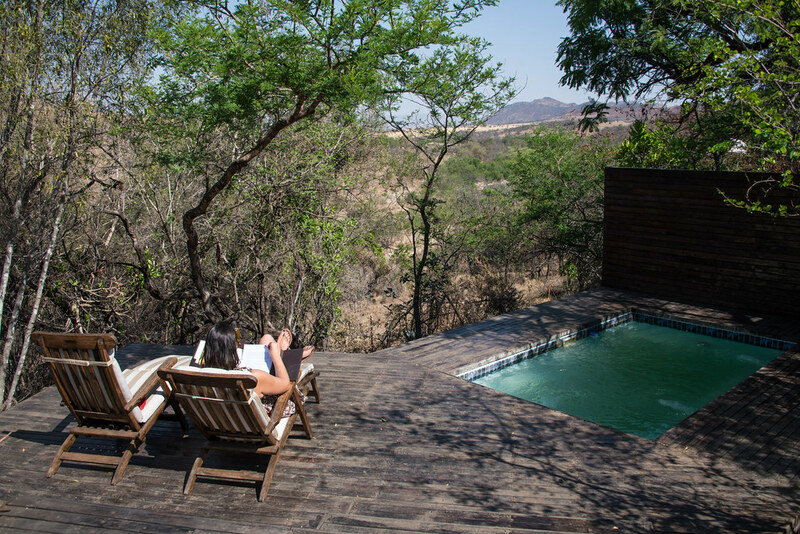 Not a bad start to our safari! 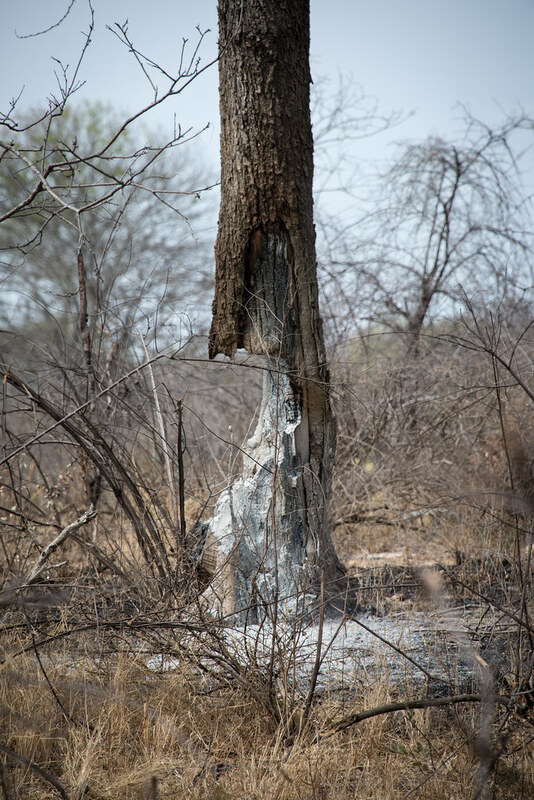 September is the end of the dry season in the National Park and we saw remnants of many bushfires near Sabi Sands. 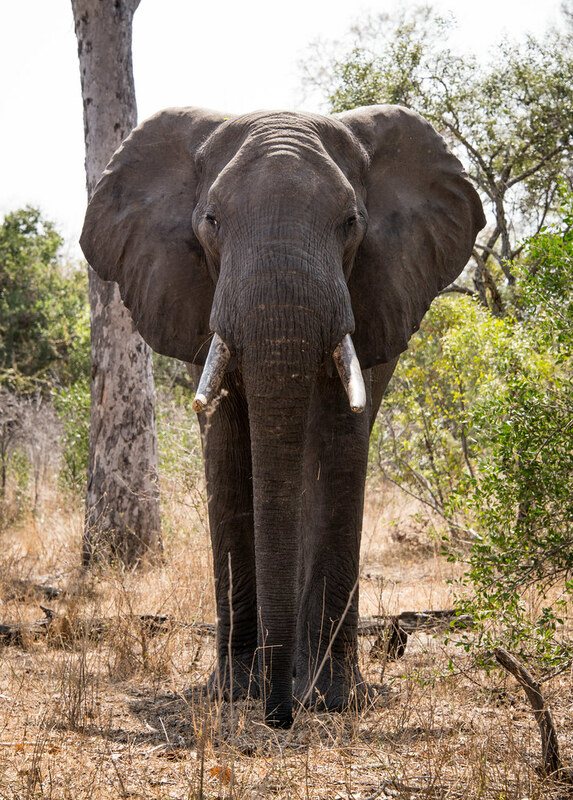 This big guy appeared from behind a bush and stopped a few meters from our car. He stared at us intently and we stared back, absolutely fascinated and completely oblivious to the fact that maybe we were in his way. Luckily for us, Emma soon realised what was going on and prompted us to move and clear the elephant’s way. 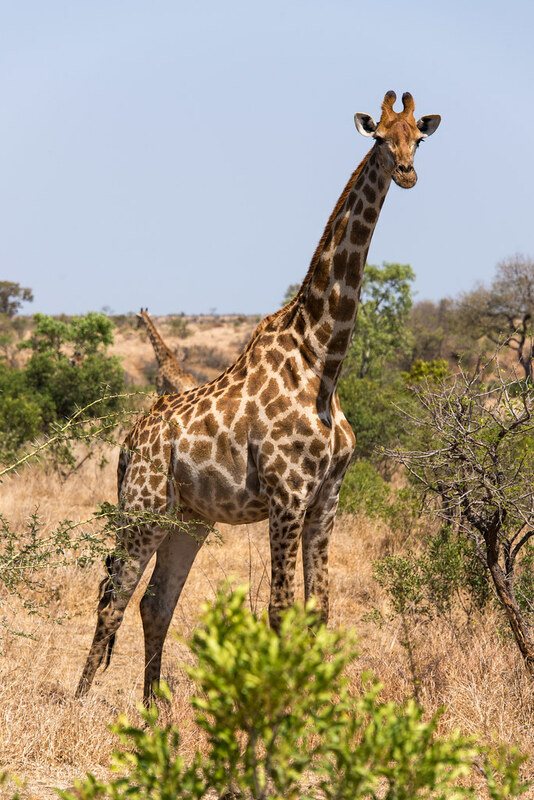 Elephants, giraffes, lions etc. always have right of way on roads in the national parks! 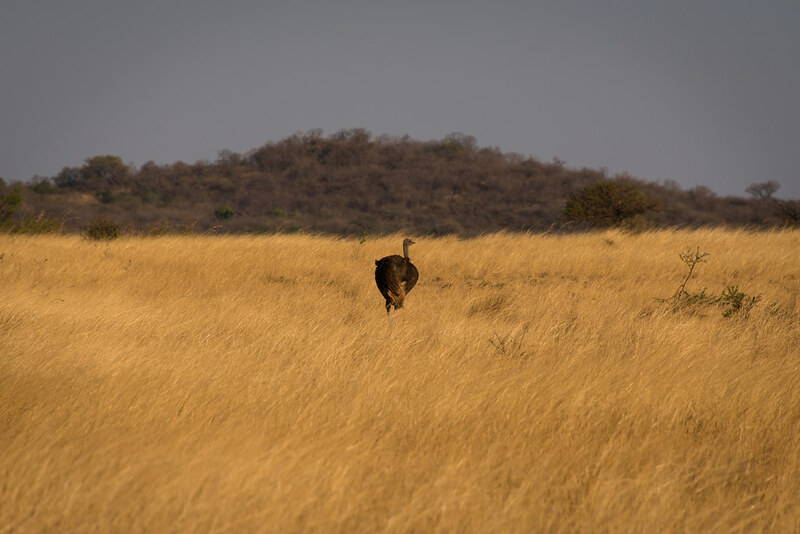 While driving through a remote part of the park during the second day, we spotted this handsome large black antelope eating dry grass behind low trees. 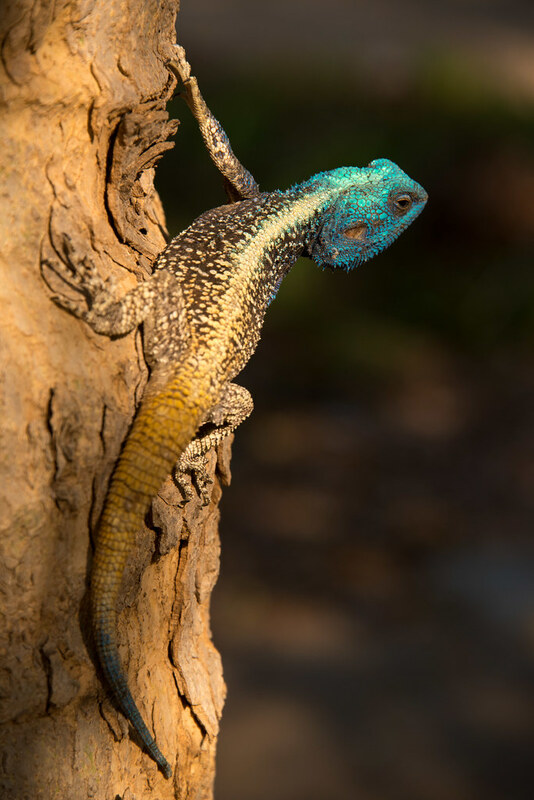 It caught our eye because we hadn’t seen one like that before and couldn’t even find a description of that particular species in our otherwise excellent wildlife guide. 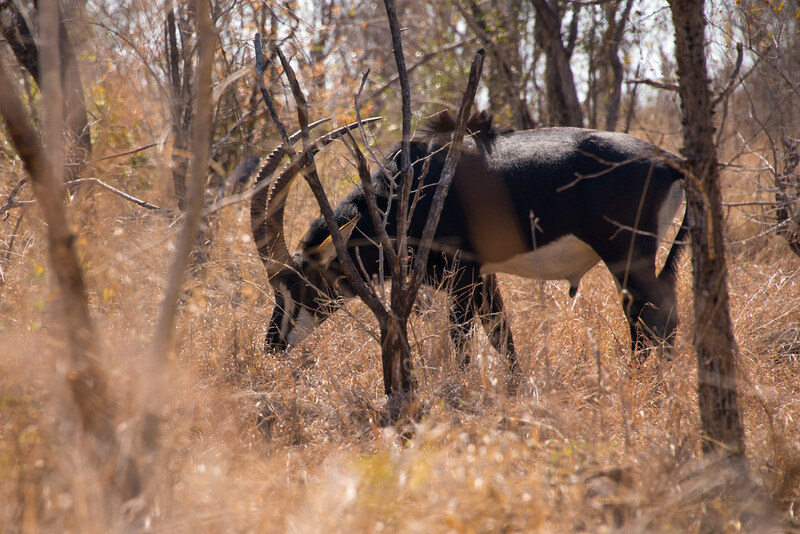 Later on in the day, during a late lunch break, we found out from the friendly group sitting behind us that it was a sable antelope. 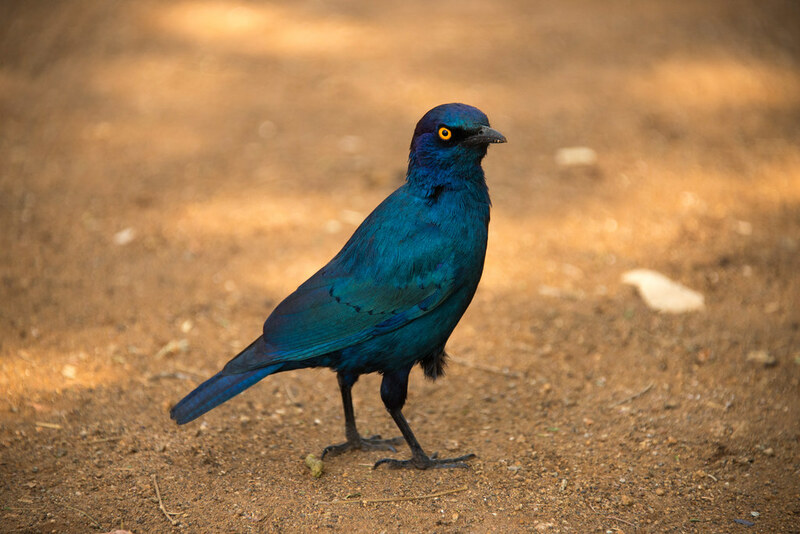 Apparently we had been very lucky to see one, since it is an endangered species and there are only around 300 of them left in Kruger. 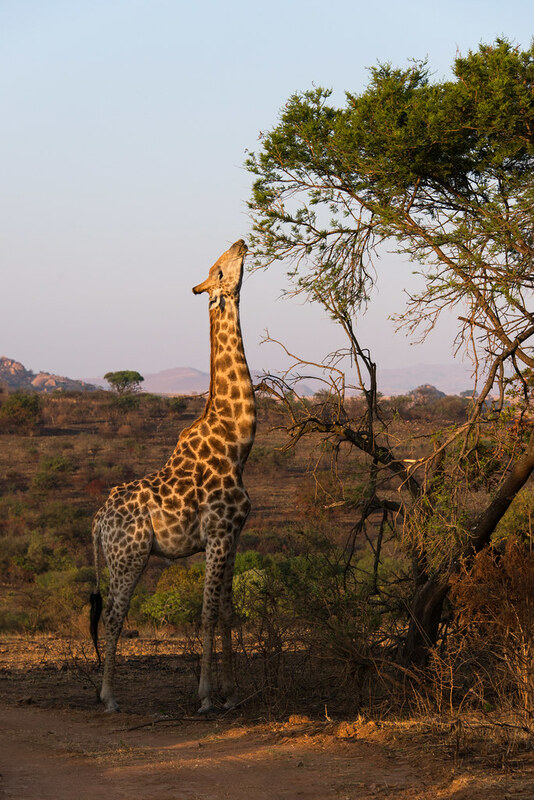 This drinking giraffe made Angela’s day. 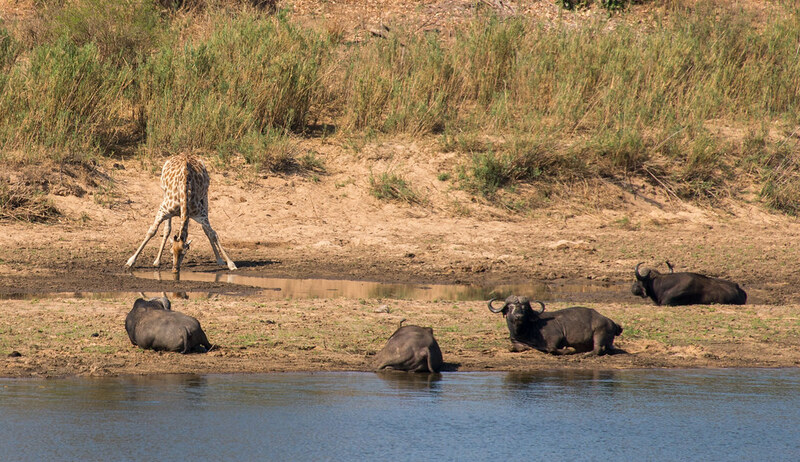 She’d always wanted to see the tall mammals splay their front legs in order to enable their long neck to reach down to the water. 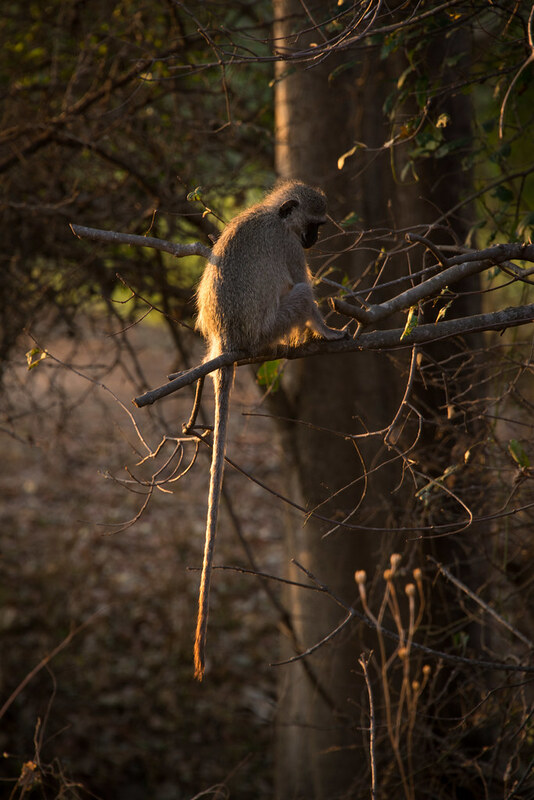 Another Vervet Monkey. 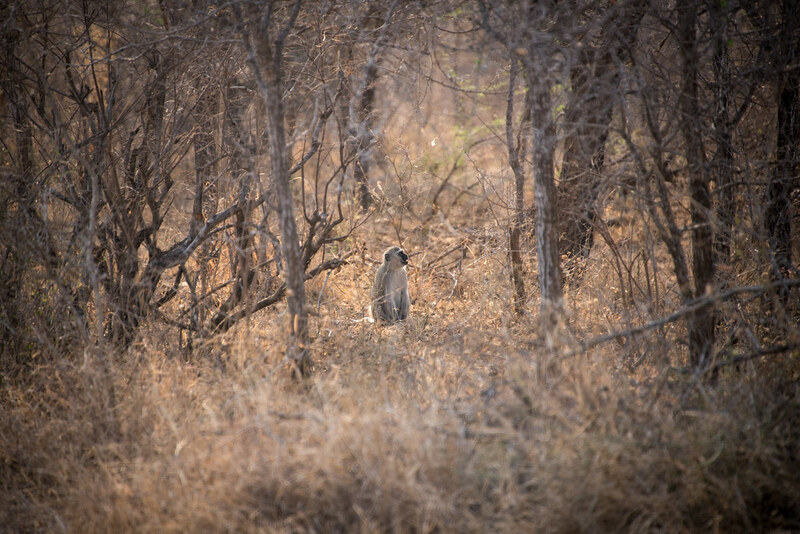 The fun part while driving around Kruger National Park in your own vehicle is animal spotting. 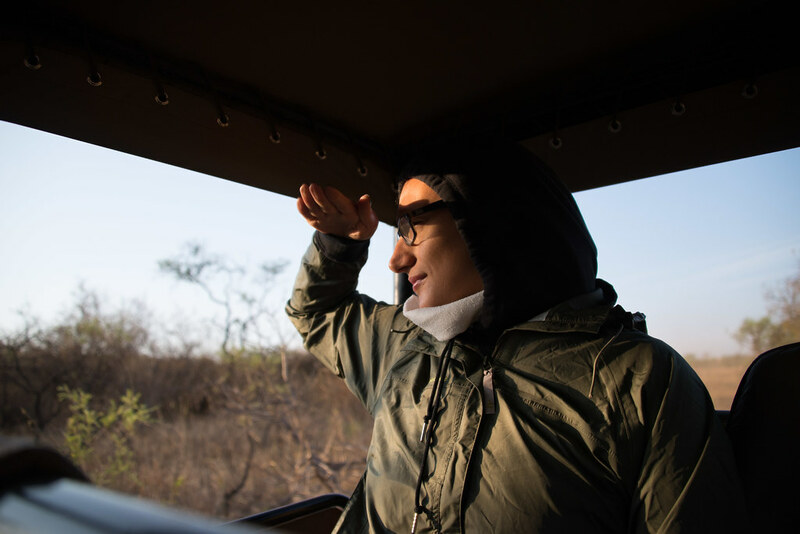 We felt very much like explorers trying to discover new unknown species. Not to mention the ridiculous feeling of pride you got when you were the first one in the car to spot an animal in the distance. 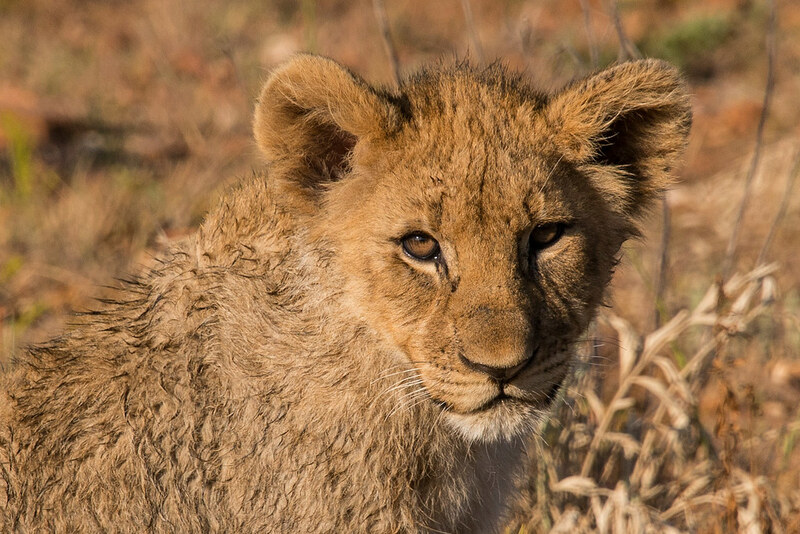 Hats off to our friend Andrew by the way, for spotting a whole pride of lions on their way down to the Sabie River for a drink. They were not easy to see, especially not from a moving car! Driving around on your own can however also be very frustrating at times. I can’t even remember the number of times I heard “Wait, what’s that? STOP THE CAR! I think I just saw a LEOPARD! 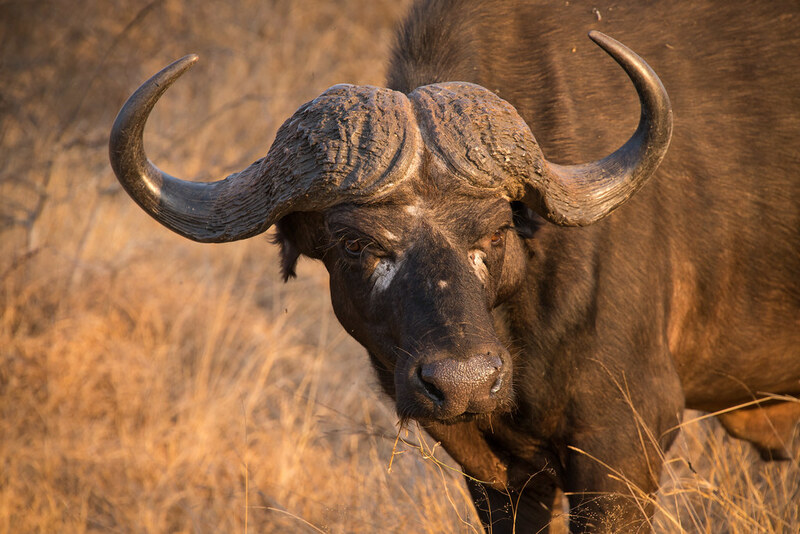 Oh wait, it’s just a pile of elephant dung…”. 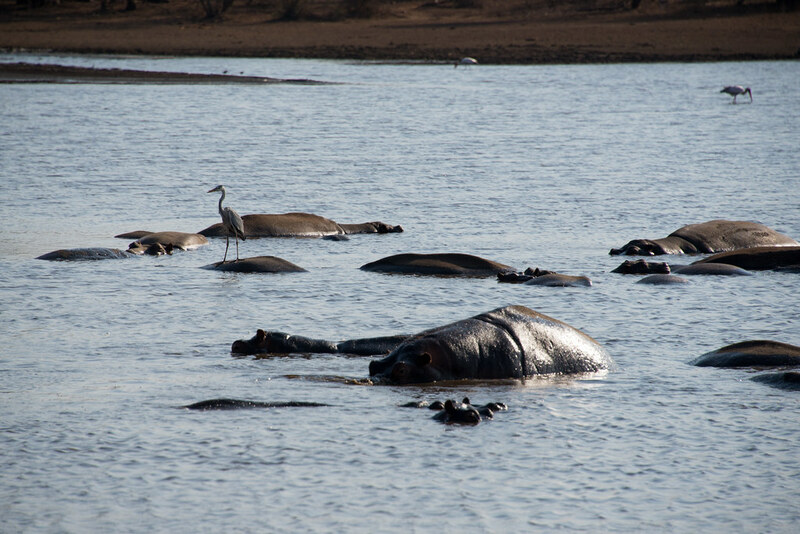 Our hope on the second day was to see some rhinos from up close. We did spot one at some point in the afternoon, but it was so far away that none of us could tell whether it was of the black or white sort, even with our binoculars. 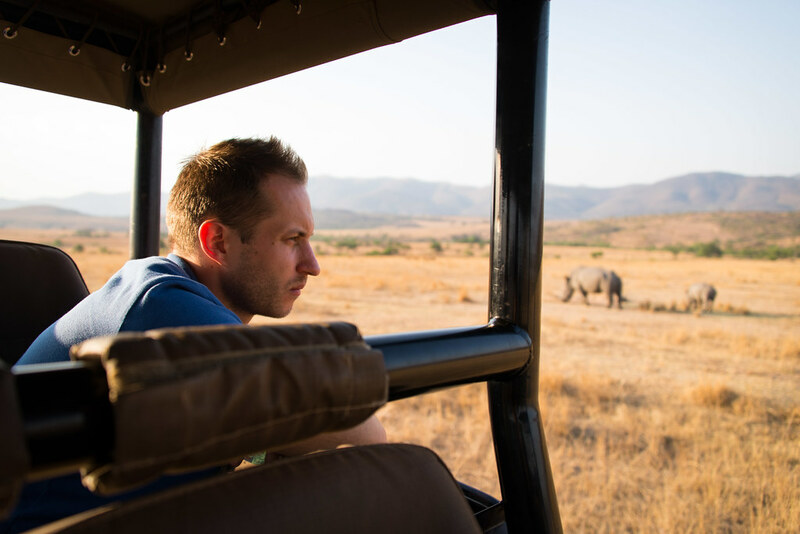 We’d given up hope and started heading back towards the park’s entrance when suddenly this white rhinoceros (also known as square-lipped) appeared on the side of the road, just a few hundred meters before the park’s gates. The king of the jungle! 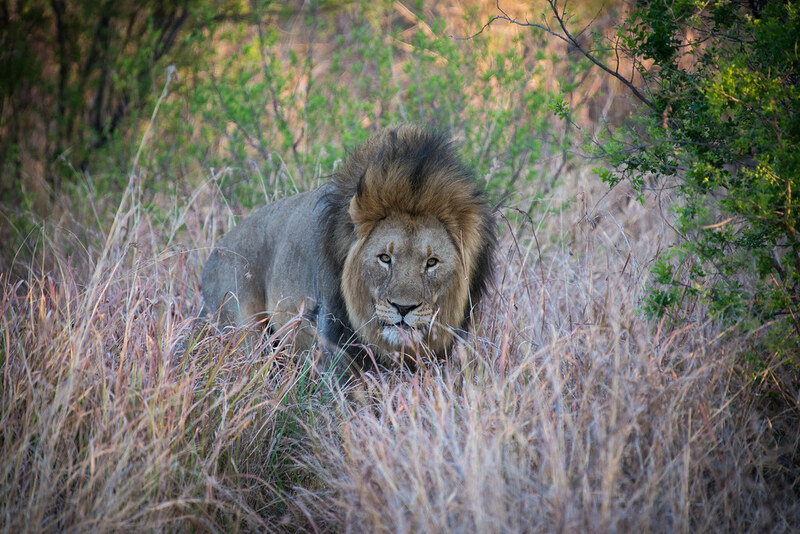 The male lion that our ranger Ulrich tracked during our first game drive looked much healthier than any of the lions we had seen in Kruger. 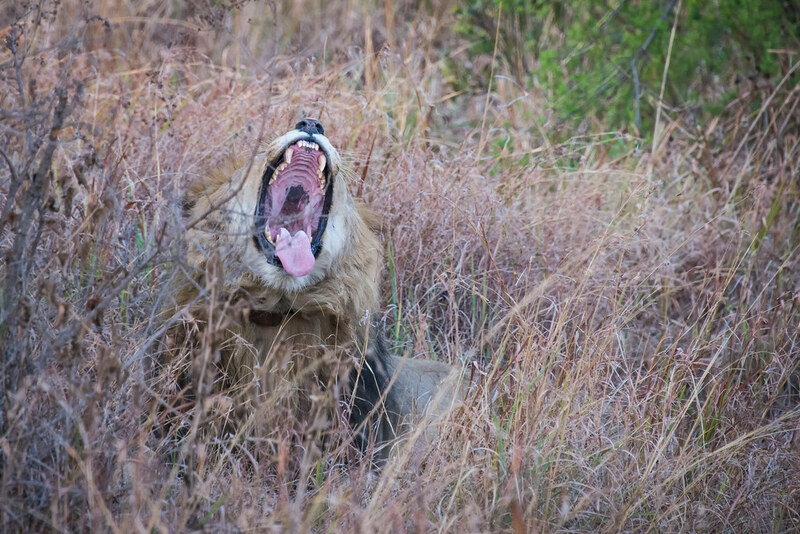 We were told that this is due to the fact that most lions in Kruger suffer from the feline equivalent of AIDS. Wouldn’t want to get my head stuck in there! 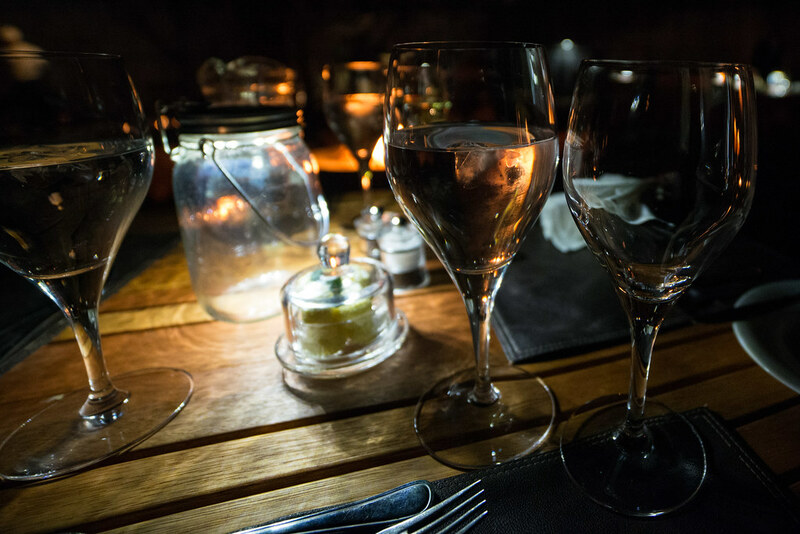 Those lights were placed on every table during our first dinner at the reserve. Manufactured by a South African company called Consol, the cool light-emitting solar jars store sun energy during the day and release it during night time, via a solar panel and LED lights situated in the lid. The morning drives started around 6AM. 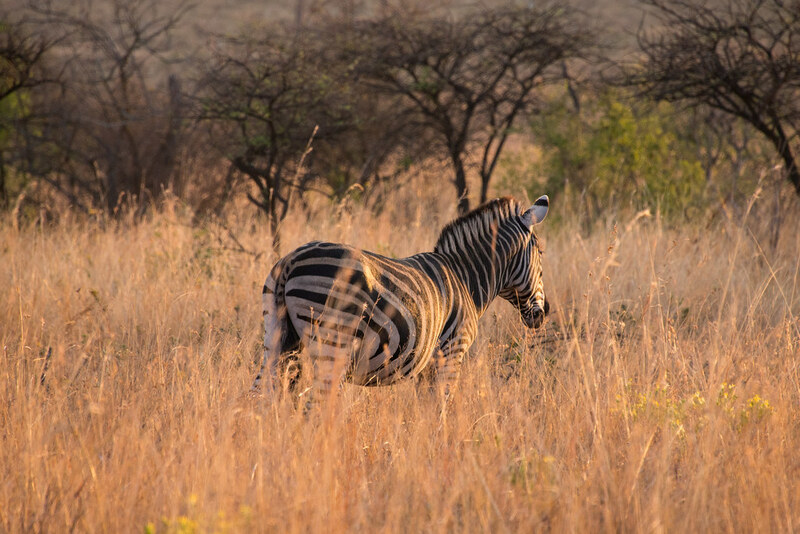 It wasn’t easy to get out of bed so early, but seeing the wildlife and the scenery in that warm morning light made it all worth it. Still a bit chilly at this time of the day! 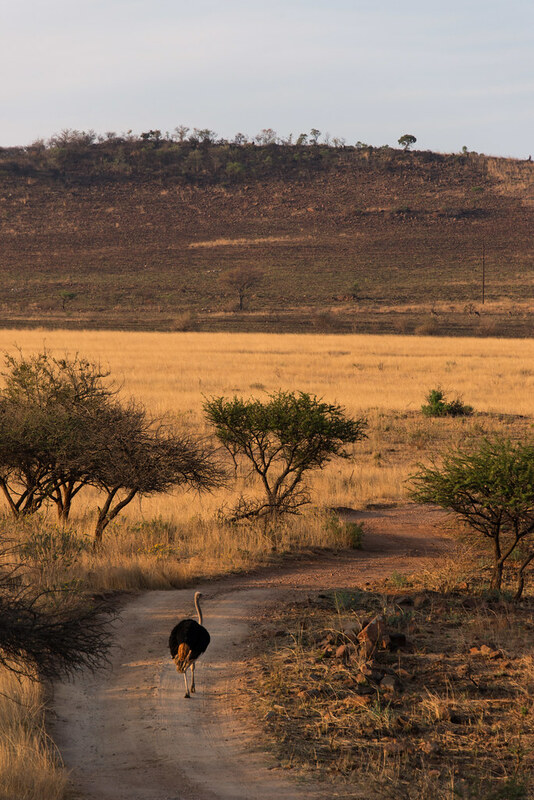 On the second morning Ulrich told us that he would attempt to track the lions again. 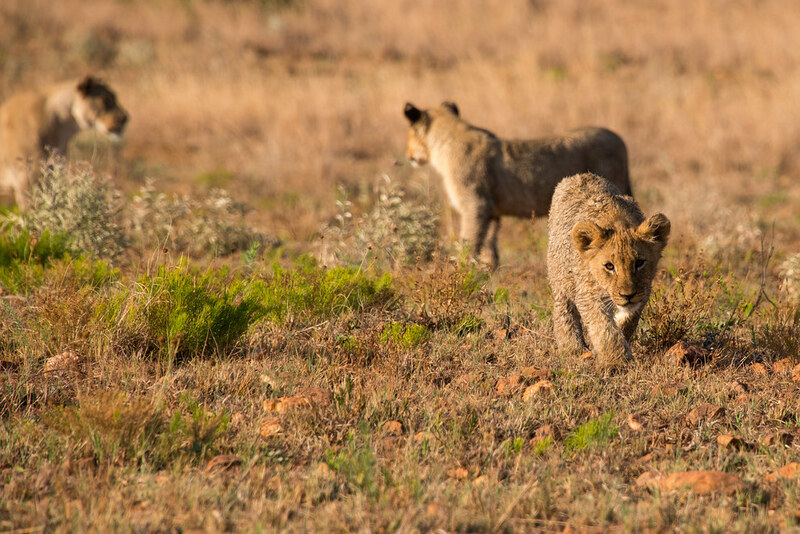 After driving around and being sent in the wrong direction a couple of times by other rangers, the lions were finally spotted on a hill side on the other side of a river. Ulrich took the 4×4 across the water and followed small dirt tracks leading to the top of the hill as fast as he could. We were the first group at the top and arrived just in time to see the whole pride of lions appear on our right. 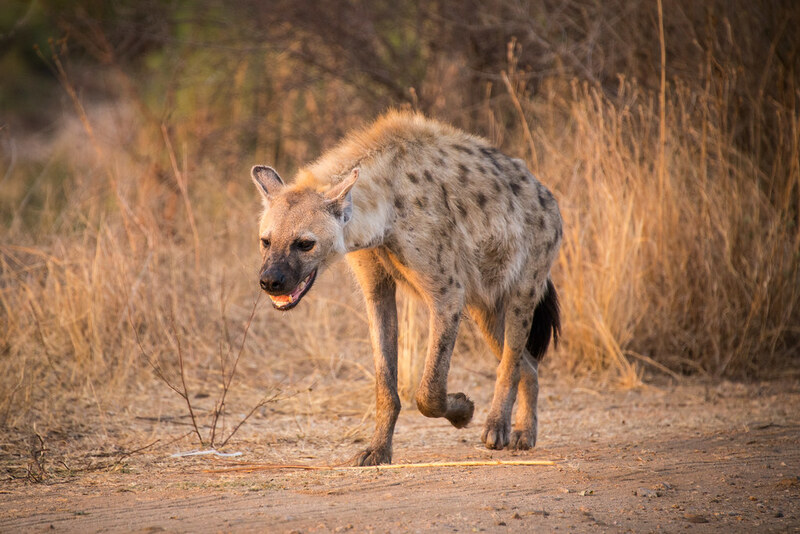 The male was accompanied by 2 females and at least 5 cubs. The young ones were very curious and came right up to the car, so close that we could have almost touched them if we had tried. The parents didn’t seem to bothered though: as Ulrich said, “they are at the top of the food chain, why should they be scared?”. 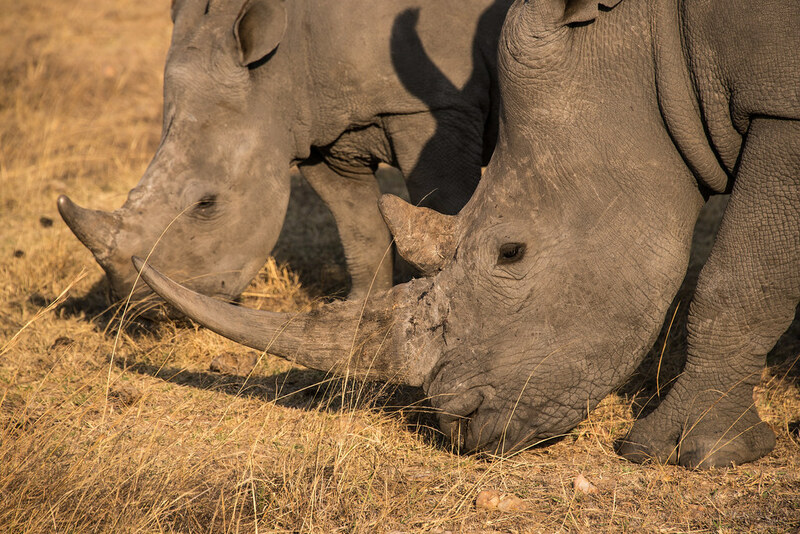 With the largest population of rhinos in the world, South African parks and reserves play an extremely important role when it comes to rhino conservation. 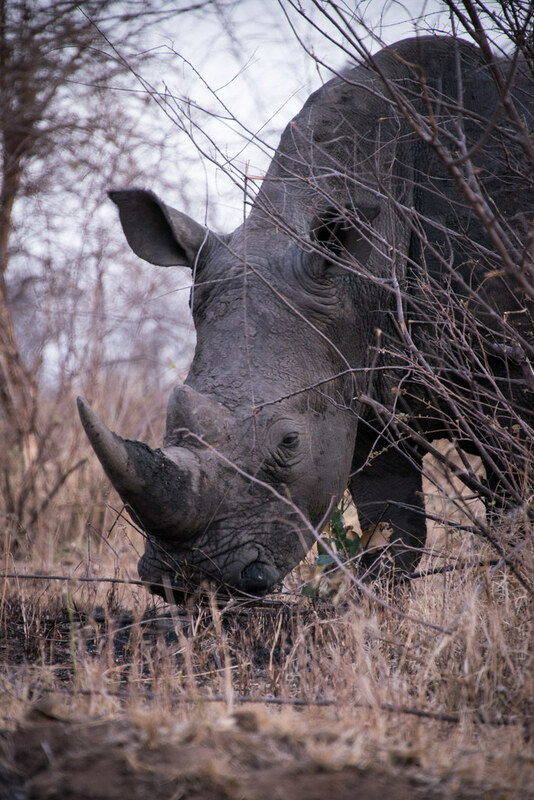 Unfortunately poaching continues to be a massive issue in the country, with as many as 1215 rhinos killed and poached in 2014 alone. 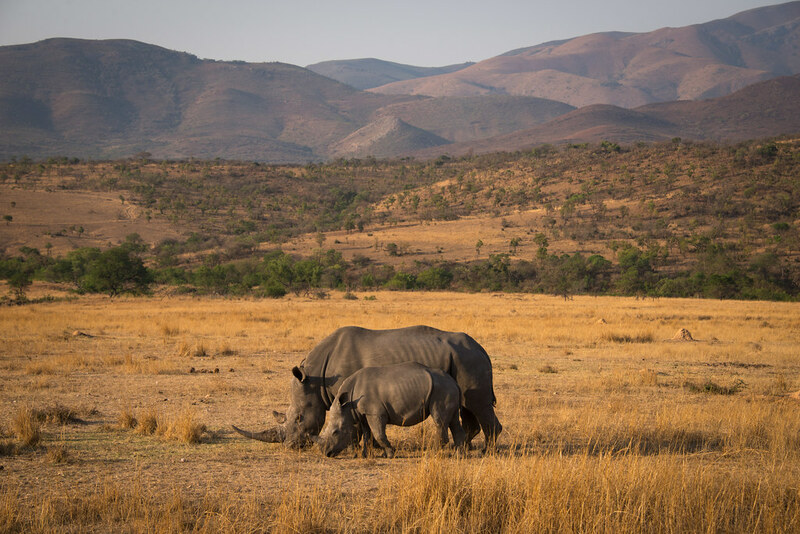 Ulrich explained to us that the Nkomazi Game Reserve employs a security team dedicated to protecting its rhino population, 24 hours a day and 7 days a week. 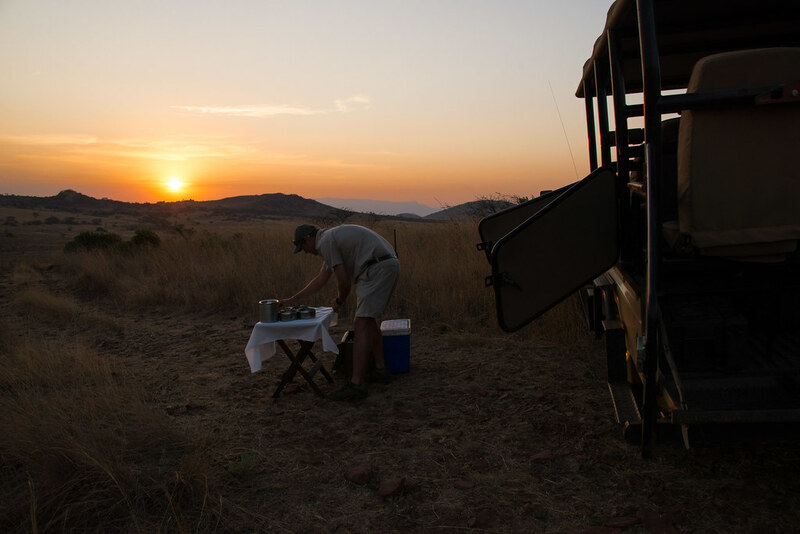 Sundowner at the end of our second day in Nkomazi, one of the highlights of our stay. Enjoying the view from our tent and the last moments of freedom before the holiday came to an end. What a fabulous trip!